Editor: Günter and Leonore von Zadow, publication date: 2003-12, source: print of 1673, RISM: I-Baf FA 1 46 etc. The Italian composer Giovanni Legrenzi wrote operas, oratorios, sacred and instrumental music. Our publication is based on the edition printed in 1673 in Venice. The music of Legrenzi belongs to the late Italian baroque time and is characterized by rich harmonies. 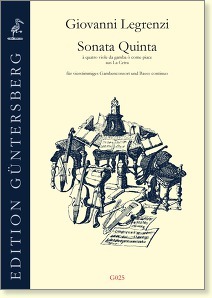 These Sonatas are marked à quarto viole da gamba ò come piace in the original, which means that they are explicitly meant for viols. The score also contains the continuo part including figures so that the quartet of viols can be accompanied ad libitum by an chordal instrument. Due to different key signs the composer had a higher and a lower version in mind. We believe that the lower version is meant for viols whereas the higher version is more suitable for instruments of the violin family. Our edition has both versions in score and parts.